Sweet Sixteen is a big birthday, but I was not buying a car. No way! My son did say he wanted a guitar, so I got him one - all covered in icing and - (egads!) - FONDANT! I said I would never use fondant. It tastes HORRIBLE! But this is no ordinary fondant. It is marshmallow fondant make in my own kitchen and flavored with almond. I found the recipe online at What's Cooking America and tried a small batch. Then I tried another small batch. Then I said "the heck with it" and used the rest of the marshmallows up! Now, there are some guidelines to using fondant. Let me tell you that you should follow those guidelines. I can't tell you how many times I had to peel (scrape) fondant off my rolling mat only to start over. I noticed that as long as I was working with the fondant and didn't let it sit, it stayed moist and did not dry out. I did not use as much Crisco as was suggested. Only when I was actually mixing the marshmallows and sugar together did I add some Crisco to my spatula and my hands. Once the fondant formed a ball, I coated my hands and my work surface with cornstarch (powdered sugar did NOT work) and kneaded the ball. To make this cake, I first had to create the template. I traced a guitar. It took 4 sheets of 8x11 paper. 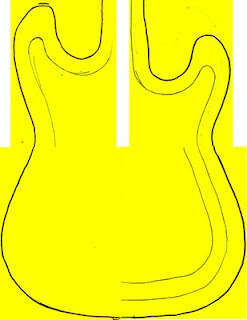 I scanned the tracings, put them together and shrunk the base of the guitar to fit on one 8x11 sheet of paper. (There was no way I was going to make a life-sized guitar for only 15 people!) The template was in 3 parts - the body, the neck and the head (where the tuning keys are). I baked and cooled a regular box cake as normal in a 9 x 13" pan (I use this Air Bake pan). I placed my template pieces over the cake. I did have to put it together like a puzzle in some places (the cake wasn't wide enough to accommodate the guitar horns so I had to cut those out separately). Once the cake pieces were together and arranged on my board, I used a piece of regular clean floss to cut the cake in half. It cuts much more cleanly than a serrated knife. I lifted the top layer off (carefully!) and iced the entire middle with store bought chocolate icing. After replacing the top layers, I iced the top and sides with store bought vanilla icing to seal in the crumbs and level out the cake surface. This is where the new stuff starts -- the marshmallow fondant. I had already made plenty of fondant. I flavored it with almond flavoring (use in place of the water in the marshmallow fondant recipe). I formed the knobs and tuning keys and other parts of the cake. Some of them were "painted" with Pearl Dust (edible metallic decorating powder) mixed with flavoring and set aside to dry. I rolled out a large sheet of marshmallow fondant (and after several tries, actually got the sheet to come off the rolling mat without sticking) and placed it over the base of the cake. The fondant started to mold itself to the cake. I smoothed down the top and gradually started to work my way down the sides doing small sections at a time. The only place that needed some difficult adjusting was the concave areas around the guitar horns. Once the fondant was pressed to the cake, I used my small spatula to trim off the excess fondant. I repeated the steps for the second sheet of fondant that was used to cover the neck and head of the guitar cake then I tucked the bottom edge of the fondant underneath the cake to create a smooth bottom. I chose not to color the fondant because after my experiences with red and black colored icing (ladybug cake and grill cake) and the steps I took to make sure the marshmallow fondant TASTED good, I didn't want to ruin it by mixing in a huge amount of horrible tasting food coloring. I decided I would "paint" the color onto the guitar. I had no idea how this would work or what my own results would be. I saw a picture of a guitar cake online where the creator had mixed food coloring and water and painted the guitar to have a wood grain look. I also watched Ace Of Cakes create a guitar cake and they airbrushed the black onto the cake. That was do-able since there are now spray cans of cake coloring on the market at craft stores, but I thought that might be too messy (and just one more thing I'd have to buy). I mixed some red food coloring gel with some vanilla extract , grabbed a brush and started painting. Note: keep the strokes going in the same direction. I only brushed on the red the first night and let it dry overnight. I put a second coat of red on the next day and it really made the red a lot brighter! The black went on a bit thicker so it didn't need a second coat. Once the cake was painted, I added the frets, rolled out a sheet of fondant and cut it out for the guitar face, and placed everything that belonged below the strings. The silver balls you see are silver dragees. They can be hard to find but many grocery stores and places that offer cake decorating supplies still carry them. For the strings, I used silver embroidery floss (silver colored thread would work just as well). I had intended to use beading wire but that just was NOT going to work. I couldn't get it to straighten out and it moved around so much while I worked with it that I thought it may gouge out part of the cake. I tied ends of the embroidery floss to toothpicks I had cut in half and pressed the toothpicks into the cake. I made the strings a bit longer than I needed so I was able to tighten them once they were in the cake by twisting the toothpicks. Once the strings were in place, I placed a dab of icing on the end of each to act as glue. I had fondant pieces that went over the ends of each string so the toothpicks were not showing. The rest of the cake went together smoothly and quickly. I glued down the knobs and other pieces with icing and used toothpicks to insert tuning keys and such. It was a great looking cake! Final Notes: Only one person did not like the fondant. Others kept pulling pieces off the cake to eat like candy. I iced the middle of the cake because I was worried the fondant wouldn't lend enough "moistness" to the cake like icing does (and my group is a bunch of icing fanatics). I have one of these to make this week for my 14 y/o son. He wants the guitar black and white with touches of hot pink but not girly looking. I found hot pink edable glitter that I plan to make look like faint flames on the black guitar. Hope all works. I have never worked with fondant but your post has been a real big help for me.Lots of info you shaired. THANKS!!! Hope my cake looks 1/2 as good as yours. I have a question regarding the painting part. Can i use liquid food coloring? Mixed with vanilla extract? Because i'm not too sure i'll find the gel one. Well i think the liquid one would be tooo liquidy .. so can i add something to it to make it more like paint?! Hi Anonymous! Liquid food coloring is fine. you just don't want to use too much water. You don't make it a thick "paint" consistency...just make a concentrated mixture and brush it on. You'll only need MAYBE a Tablespoon of total "paint" each time. Mix up a fresh batch for the 2nd coat, too. Great instructions. One thing to make sure of is to smooth the fondant out which will make the painting easier (no cracks to get into). I filled a glass with tap hot water and soaked table knives in it, and used them one at a time while still hot to smooth the fondant. As long as the knife is hot and clean, it won't stick. Rotate the hot knives. I've reached the red & black paint stage and will be finishing the rest tomorrow and I hope that I can attach a photo to this somehow once it's done. This was a great post and your cake looks fantastic. Thanks for sharing ll of the tips and in depth instructions! Thank you for letting us know how you did this great design.. It's so cute.. I have one of these this weekend. I traced the guitar body onto freezer paper and it is huge. How do I shrink it? Could I take it to a office supply place? Any suggestions? If need be, you can click on the picture of the guitar tracing, save the image to you computer, open it in Word, PowerPoint, or some similar program and enlarge it to fit the entire workspace. It should then print onto an 8x10 sheet filling the whole page. Good Luck and enjoy! Fantastic cake and fantastic instructions. Thank you for sharing! You can "grease" your countertop with shortening and rolling out the fondant on that. It leaves it nice and shiny and doesn't stick. Thanks for the great cake idea! Hi! can i please know wad did you use for the knobs and tuning keys?? thanks!! Hello! I used scraps of the marshmallow fondant for the tuning keys and the knobs. Everything is edible except the strings and the toothpicks. Thank you so much for this detailed post! I made the cake and it took me two days. I purchased the red fondant because I hadnt used the paint technique before. It turned out great!! Thank you so much for the in depth details on how you made this cake. I have to make a guitar cake for a friend of mine's groom's cake and I think this is the most in depth instructions I have been able to find online. I make a lot of cakes but never a guitar cake, and I have never used fondant so I am still kinda iffy on that. I hope my cake turns out as great looking as yours. Again, thank you for all the in depth directions. Thanks for posting this! It's awesome!! I made the cake all the way through the 1st coat of "paint" on day one and did the second coat of paint, frets, knobs and strings on day 2. The party was day three. I didn't freeze it or refrigerate it at all during that time. First things first...forget about people who might criticize your work. You are doing this out of love for your son. Have them make the cake next time if they have one negative word about it. You should be able to cover your cake and have some left over for the letters and other decorations with just the one batch of MMF. The recipe makes a lot. I've always had some left over. If you need more, it's not a problem to make more. Also, look at my notes on the end of the Working with MMF post ( http://kidscakes.blogspot.com/2009/03/working-with-marshmallow-fondant.html ). I just knead the fondant for a long time (about 10 minutes) then let it rest in a owl on the counter covered with a towel. The knobs and such can be molded whenever you want. You can mold those while your cake bakes or cools, etc. Or you can make them right when you need them. The MMF letters can be attached to the MMF on the cake by moistening the backs of the letters with a little bit of water (to act as a glue). Just wipe some water on the backs of the letters with your finger...only enough to wet it. Use the "less is more" theory. If you run out of time one day and need to store your MMF, put it in a large ziplock bag with the air squeezed out of it. Pull it out the next day and let it come to room temperature. You can also microwave it if you're in a hurry, but do it in short spurts so it doesn't get too hot and scorch. I'll keep that in mind..
By "mess" do you mean it seems to have dried out? Try placing it in the microwave for about 10 seconds then kneading it. If it is still too dry, you can always add a small (and I mean SMALL) amount of water to it and put it back into the microwave for 10 seconds. If 10 seconds is not enough to get it workable with your hands, try another 10 seconds. Pull it out and knead it really well. If it still seems too dry and not elastic enough, add a little more water and repeat the process. I did everything you said but still didn't work.. :( I'll just make another one... It is too dry though it is soft every time I knead it still too dry and cracks... Do you think I can do the MMF on the same day that Im going to put it on the cake so it will be pliable and elastic? Yes, you can definitely do it on the same day. Just knead it for awhile then let it sit for an hour or so and knead it again. Put it in a zip top bag when you let it sit. Make sure all the air is squeezed out of the bag. When you're working on the cake itself, only have out the fondant you are working with to put on the cake. Keep the rest sealed. That will help to keep it from drying out. 1. What did you use for the board? 2. How did you do the candles? What are they stuck in? The board is a large silver cardboard tray I purchased from Party City. I think it's just a few dollars. The candles are just stuck in mounds of icing :) I do that a lot when I don't want to push candles into a cake. Just wondering where you got the pieces for the neck and head if the body fills up the 9 x 13 pan. What am I missing? Thanks! The body is the size of an 8x11 sheet of paper. Once that part is cut out of a 9x13 cake, you have some scraps left over (including a good size strip to be used as the guitar neck). The neck isn't very wide - 2" or less across. Oh, I also want to mention, I'm pretty sure the cake template went horizontal across the cake - because the guitar horns were cut out separately. That makes for a LOT of extra cake scrap for the neck (which I believe was also cut out horizontally) and the head. 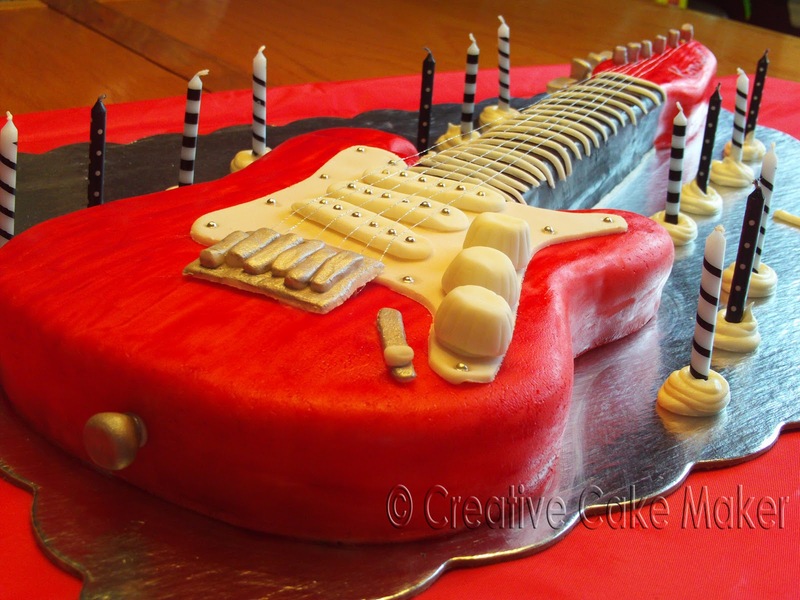 Hi came across this on the internet when searching for ideas for a guitar cake. your instructions look amazing and I am going to have a go. Just one question how many people would this feed. This cake is made from one box of cake mix baked in a 13x9 pan with a little bit of waste. So you can figure how ever many people can normally eat from a 13x9 cake can be fed with this cake. It also depends on how you cut it and what sizes the pieces are. We fed about 13-15 people and had some leftovers.